After a record-breaking year in 2018, Welcome To Rockville returns even bigger in 2019. 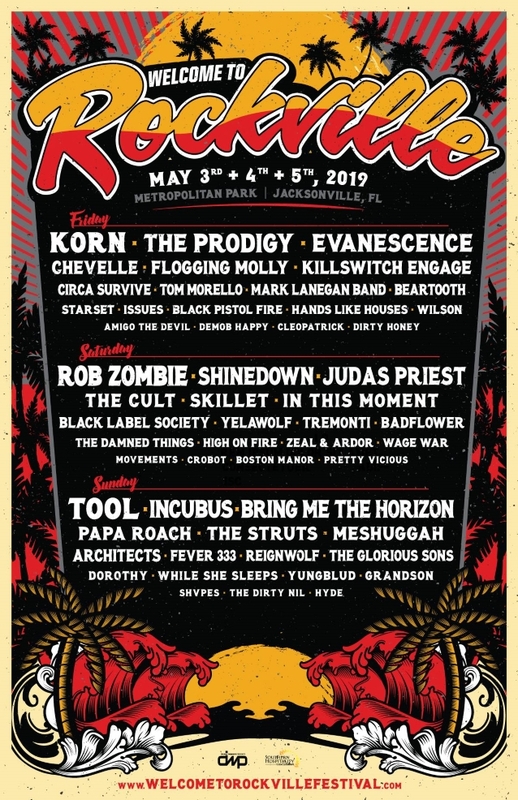 The ninth annual edition of Florida's Biggest Rock Experience will take place Friday, May 3, Saturday, May 4 and Sunday, May 5 at Metropolitan Park in Jacksonville, Florida and will feature must-see headlining sets from some of the biggest names in rock including TOOL, KORN, ROB ZOMBIE, INCUBUS, THE PRODIGY, SHINEDOWN and JUDAS PRIEST. General Admission and VIP tickets, as well as hotel and camping packages, for Welcome To Rockville go on sale Friday, December 7 at noon ET at WelcomeToRockvilleFestival.com. Rob Halford says: "JUDAS PRIEST are primed and ready to unleash new 'Firepower' with full metal fury on the USA again as we are one of the headliners at Welcome To Rockville in Jacksonville, Florida! The PRIEST is back!" Chris Kilmore of INCUBUS adds: "We're excited to return to Jacksonville and play at Welcome To Rockville in 2019! There are some great bands on the bill and we can't wait to see our friends in TOOL, THE PRODIGY, as well as many others. See you there!" VIP tickets include: a VIP entrance to venue; access to VIP lounge area featuring dedicated bar, beverage and food service; viewing of main stages; seated area with shade for dining; private restroom facilities; and a VIP guest laminate.